In the Italian language , Aglio simply means garlic and olio means oil...so this pasta has lots of garlic and a generous toss of olive oil. 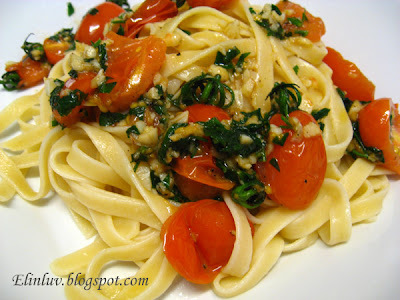 I added some chopped fresh italian parsley and mini plum red tomato for extra flavor. Great combo and if you are a health freak....you will love this ! Shoot me if you don't like it :))) Simple and easy preparation. 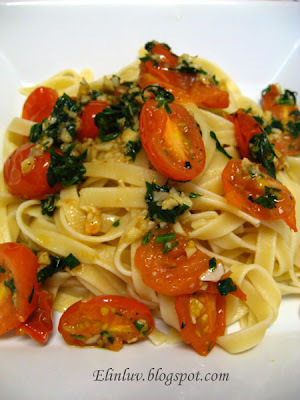 Less than an hour I got my family seated and slurping away and enjoying a delicious homecooked fettucine aglio olio ! the last shot is always the best......yummmilicious! This looks perfect. Aglio Olio is one of my favorite pastas. This is simple and beautiful. 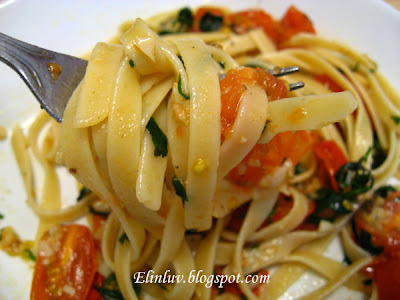 Only you can make simple dishes like pasta aglio olio look so indifferent from its usual ones! This looks wonderful! The tomatoes look so bright, and I can imagine this was tasty! This is my family's favourite and we could eat it everyday...no problem.Next time,try it with lots of fresh parmesan cheese,not the smelly granules ones.It may not be that healthy,but taste very good. 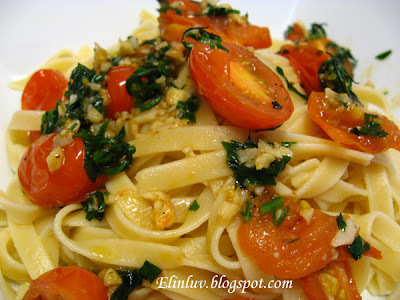 Your fettucine Aglio Olio looks delicious, fresh and so appetizing! Look at the vibrant colour of this fettucine, so beautiful! it's my favourite ...... gosh, if i have the ingredients, i will cook it right now (7.15am)! it's a torture looking at your perfect looking aglio olio and having to wait for hours till the shops open. Fettucine, I haven't try to cook one. I would love to have such breakfast. Lucky Piggies. @ Miranda : Thanks Miranda:) it does taste good. 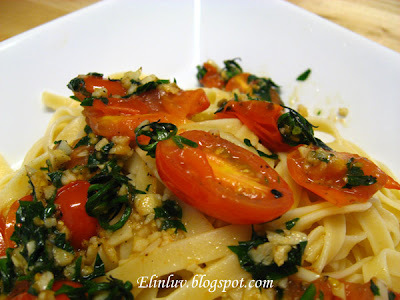 @ TEAH : yup this mini tomato blends well in aglio olio style :) Thumbs up!